Sorry for another outlines comic. Will get it colored tonight. I don’t know whats up with this chapter but all the dialog has been, really hard to pass. Like I do not get at all what Selkie is trying to say. Breaking someones wills is a negative thing, i don’t understand the one wills bit either. even if I take into account her pluralising tick. She may be doing a i’m an evil overlord joke about sugarcoating people right now but that doesn’t quite fit with his response… or it dose and this guy is creepy as hell. Selkie is doing the supervillain thing. Or so we hope. If the Jin’Sorai clas was destroyed, there is the likelihood that some of the survivors will hold a grudge. Some might even take it too far. When it comes to genocide, what retaliation is ‘too far’? I’d say genocide the other direction, at least. Certainly won’t fix things, anyway. I am hoping he’s just noting that she hasn’t gone native yet. Living among the humans but having a bit of the spark of her people. Hoping. I took it as Selkie made a clever, self-confident, comeback and Glenn appreciates her quick wit. She’s in an unfamiliar setting but is able to make jokes (we assume, because otherwise she’d be eeeeeeevil for real and not just pretend) and I think he respects that. It doesn’t have to have a nefarious reason behind it on either her part or Glenn’s. Alright but…she breaks free will? What does that mean? Sorry, really having trouble to parse the meaning of what she’s saying, unless it’s a reference to something I’m not catching. Gien calls her “our prodigal.” There’s only one context for that, really. “Our prodigal returns.” I’m pretty much expecting an attempt to keep her “for her own good” so that she can “learn the ways of her people” or some such excuse. I am also remembering that Selkie’s mother voluntarily gave her up to a human orphanage rather than risk any danger to her daughter, and these people seem to know exactly who Selkie is. honestly, i think he might be merely concerned for her welfare. 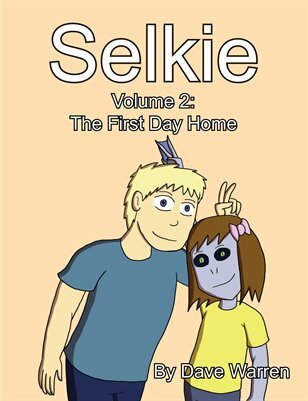 i mean, if you see it from his POV, selkie is a defenseless kid living in an unnatural environment among a strange species….the way he instantly feared the worst about her name change speaks volumes about his experiences with humans and what he feared they might do to selkie. Oh, I believe Gien would think he’s doing the right thing, but I also don’t see a willingness to be convinced he might be wrong. That could get nasty very quickly, with the humans at a decided disadvantage given the environment. I’m not even sure that Then would be on the side of the humans, honestly. Remember, my dad dealt with foster kids, Juvenile Hall, orphans, and all that that implies. “The road to hell is paved with good intentions” and all that. Vaguely sinister overtones, is all I’m saying here. I don’t get this joke, who’s breaking what now? Not a refference to Free Willy or is it? Now, if you mean it’s odd to call someone “seal-person” my wife’s name in Chinese means “Graceful Information”, and lots of Native Americans have names that are descriptions, not proper nouns. Tons of European people have names that are descriptions too. Charles, for example, means manly; Vivian means lively; Joyce means joyous; Claire means bright; Frances and Frank mean either French or truthful. There are thousands more. I just meant that to me Nei Li just sounds like any other Chinese name so I wouldn’t think twice about it, while Selkie screams anime / video game character name like Blade or Dragon. This is similiar to how Scar to us and Selkie seems like an edgy name, when in tensei it might not mean anything or be the equivalent of John. And he was quite an entertaining writer. I have a few of his stories. Every single name in the world means something. All names originate as words or phrases. The only reason people of European origin tend to forget this is because our spoken languages and names have evolved in different directions, so our names rarely resemble their corresponding words any more; also we use a LOT of names from foreign languages. Occasionally people just string together syllables they think are pretty. For some reason I can’t reply directly to A.Beth, so I’m posting it as a reply to myself instead. Well, I stand corrected, I guess. I do think this is the exception rather than the rule, though, and my comment was mostly in response to the sentiment that “lots of people have names that are descriptions” as though this was not basically how names work. Especially All-Purpose Guru’s baffling belief that Native American names being descriptive, for some arcane reason makes them NOT proper nouns?? Tell me about it! Mine means “bitter.” 😛 That torqued me off something fierce when I was in single digits. Hey Dave, thank you for posting something! Don’t forget to take care of yourself while you’re feeding us ravaging fans with good fun. We *can* wait while you sleep/eat/enjoy life/etc – perhaps not super-patiently, but we really can. Gonna point out again that the Jin’Sorai- or at least their voice was all about an eye for an eye, blood for blood in response to the humans killing someone, not of their clan; and were not above using a family’s tragedy to undermine their political rival with whom they had been clashing with for quite a long time- if not always. It would not surprise me that the ones that were supportive of the Jin’Sorai’s ideas of coming out to the surface world and demanding humans take responsibility for what happened to not think much of humans, let alone the idea of humans raising their people’s children by passing them off as human and not as not-human for their “protection”. They are going to be critical, they are going to be understandably frustrated and angry at the whole thing and they don’t need a reason to not like Todd because they already do. Is it fair or right? No. But welcome to politics and policy. Everything Todd is going to do or say is going to be wrong until they accept him up to a point. He’s going to be brushed off, he’s going to be treated like a stupid ignorant human because humans are the ones that contributed to their situation in some shape or form. Some are less grudge holding than others- obviously. But Then and this guy- who seem more involved in the politics- are holding the grudge. I would like to think the fact that Selkie’s snappy wit and what some would see as rebellious behavior is still intact and strong would show that Todd has not taken great steps to “humanize” her any more than needed- but like I said, anything and everything Todd says or does is gonna be wrong and they sure as heck wouldn’t want to give any positive feedback. Though it is notable that Selkie’s mom went and turned her over to humans so maybe we will get some kind of explanation on why. Also- Todd knows a short version of what is going on, not details and Selkie doesn’t not other than there is something going on like a war. It seems to me that this Clan was prone to violence and possibly enslavement. Warning signs. Got to be careful in judging the clan for their “leaders”. Not sure how much say the common people might have had or how many of them were in consensus. So apparently all the Jin’Sorai are supervillains. Gotcha. I’ve been reading this webcomic since the beginning and I was wondering this comic has mentioned Selkie’s birth mom but how come there isn’t any mention of Selkie’s birth father? I know Todd will always be her father because he loves her just like any parent loves their child or children adopted or not. I hope Dave gives an answer to this. In the beginning, when we see her mother leaving her at the orphanage I had assumed that her father was already dead. Now, I’m not so sure. The subject of Selkie’s biological father is not yet a subject for discussion. Please note, that “yet” is intentional. Hiding key words in your posts, are you? Well, lets see what I can deduce from this. “The”…Quite a way to start something; that’s a loaded word. “Of”…That’s it, I’m finished with these key words. There’re only so many implied inferences of innuendos one person can take in a single post. On that, Dave, we only have two examples of families in the Sarnothi culture, and both of them are on land– do Sarnothi typically pair up in family units normally? In other words, do both Mom and Dad hang around and parent the kids? I get the joke and all seems normal to me. Oh my god, a whole clan of Selkies!